"Till The End Of The World You'll Be Mine-- Pat Looses Champion"
This is your ranch foreman, Big Jack Little, inviting you to join us for a shindig of western music and song. Starring that great singing cowboy, Gene Autry, you'll have a hootin hollerin heck of a time at Melody Ranch. Join Gene Autry and his sponsor, Doublemint Chewing Gum, along with all his cowboy friends as they sing till their boots scoot. So get back in your saddle, hitch up the wagon and head west to The Ranch. Your horse will be glad you did. 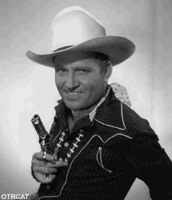 For more Autry performances, see also the Gene Autry and Melody Roundup recordings. Just want to tell you how pleased we have been with OTRCAT.com...wish we could buy them all! Recommend you to friends & family across the USA.! Wishing you and yours a great holiday season and a super successful year.